The new Renault Captur looks mighty impressive, but how does it compare against its established rivals on paper? 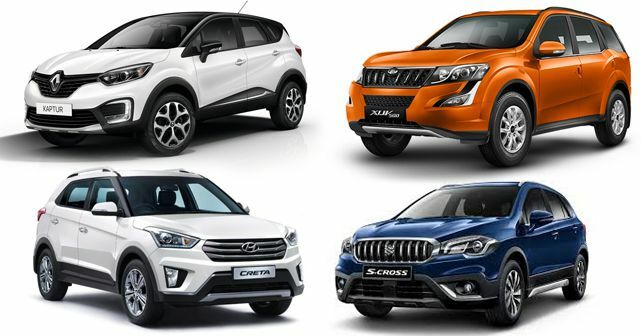 Crossover or compact-SUV segment is undoubtedly the most happening place in the car market for the past couple of years. And if there’s one car that has single-handedly led the way in this category from the very beginning, it’s the Hyundai Creta. Not only does it sit at the top of the sales game in its segment even today, it’s also a hugely capable product and one that's quite hard to beat. To dethrone the Creta from the top, other auto-makers need to come up with something really extraordinary. And while everybody may not be up for it, Renault and Maruti Suzuki definitely want to have a go. In the span of the next few weeks, Renault will launch its premium crossover, the Captur, in India, while Maruti Suzuki will also be bringing the S-Cross facelift here. But, the obvious question is this - can these two new products match the Creta’s popularity? Are they any good? Well, for the time being, we can only compare them on paper and let you know. And just to make it a wee bit more interesting, we’ve also added the bigger and more powerful Mahindra XUV500 in the mix. The XUV500 is, of course, the biggest vehicle of the lot, but if all you want is a 5-seater crossover, you’re likely to zero in on the other three. Among them, the Captur is surprisingly longer and wider than the Creta and S-Cross. Of the trio, it also has the longest wheelbase. The Creta, however, is the most SUV-ish with an overall height of 1,630mm. That said, its ground clearance of 190mm is less than the Captur (210mm). The S-Cross, on the other hand, has a ground clearance of 180mm, which is no better than many of the hatchbacks available on the market. The updated S-Cross’ boot space is 430 litres, which is much better than the outgoing model. The Captur’s luggage compartment has a capacity of 437 litres, while the Creta’s boot capacity is 402 litres. The XUV500 has the biggest boot – but only when the third-row is folded flat. Otherwise, it’s quite disappointing (96 litres). Let’s start with the latest entrant, the Renault Captur. The Captur will be offered with the same set of 1.5-litre petrol and diesel engines that are available with the Duster. However, there’ll be no automatic transmission on offer at the moment – the petrol will come with a five-speed manual while the diesel is mated to a six-speed manual. If you want an automatic transmission, Hyundai has you covered since the Creta is available in automatic for both petrol and diesel versions. That said, it’s not available with the smaller 1.4-litre diesel engine. All the Creta variants come with a six-speed manual transmission as standard. The XUV500 is also available with an automatic transmission and it’s the only vehicle available with an all-wheel drive system. Not to mention, it has the biggest and the most powerful engine of the lot. As for the S-Cross, it has the smallest motor on offer – a 1.3-litre diesel engine, paired with a five-speed manual transmission. The 1.3-litre unit will also come with Maruti’s SHVS mild-hybrid system for fuel-saving. And, yes, the 1.6-litre engine won’t be offered in the face-lift, so performance enthusiasts should look elsewhere. One of the reasons why the Creta is so successful is because of its rich feature list. Same is the case with the Mahindra XUV500. As for the S-Cross, the current model is decently kitted out and the new one will only add a couple more premium features. The Renault Captur is pitched as a premium offering and since its main rival is the Creta, the company has loaded it with features. Here’s a look at some of the key features of all the vehicles. Renault will be offering ABS, EBD and dual airbags as standard across the Captur range. In comparison, the Creta also has ABS, EBD and dual airbags as standard fitment. However, the top-end of the Creta gets six airbags. Maruti Suzuki is expected to launch the updated S-Cross with the same set of safety equipment as standard as well. Although, the new S-Cross is likely to miss on six airbags. Dual airbags and ABS with EBD is part of the standard equipment in XUV500 as well, but like the Creta, it's higher-end variants are equipped with six airbags. Pricing will undoubtedly play the most crucial role in deciding the Captur's success in India. As a result, it's expected to undercut the Creta's prices by a considerable amount. The manual versions of the Creta are priced between Rs 9.29 lakh and Rs 14.48 lakh (ex-showroom, Delhi). The updated S-Cross will also undercut the Creta's prices. The Mahindra XUV500, on the other hand, starts at Rs 12.64 lakh (ex-showroom, Delhi) and its top-end automatic all-wheel drive variant is priced at Rs 18.75 lakh (ex-showroom, Gurgaon). However, its mid-range variants are more likely to take a hit once the Captur arrives.